I've just uploaded new onArcade.com website. Apart from being moderately better looking, it is also responsive and mobile compatible. I'm still working out some kinks here and there, but it should work without problems in all modern browsers. 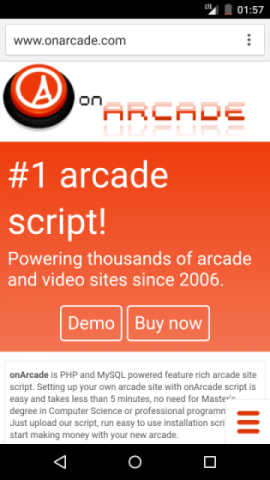 Next onArcade release will also bring mobile support for onArcade powered sites. What is the URL of your site? It is more difficult with onArcade script, because there are lots of sites with different templates and there is no way of making them universally responsive. But I understand the problem with google and I will try to come up with a solution. (04-21-2015 11:16 AM)Hans Wrote: What is the URL of your site? It is more difficult with onArcade script, because there are lots of sites with different templates and there is no way of making them universally responsive. But I understand the problem with google and I will try to come up with a solution. URL in a private message . Thanks, got the message. I think I'm going to backport some things from onArcade 3 to onArcade 2.4 and release it as onArcade 2.4.2 to solve this issue with Google. It may take a couple of days, but it seems like the quickest solution right now. Not much more waiting to do You can see demo at http://www.onarcade.net/ , still working out some problems and going to release today/tomorrow.